TWO - HID kit problem eliminator plugs. Get rid of the strobe light effect in vehicles with aftermarket hid kits. Eliminates annoying bulb out dashboard indicator light. If your vehicles new hid kit flashes like a strobe light when you start your vehicle, then this is for you! If your vehicle a bulb out indicator light on after installing your hid kit then this is for you. Our new problem iminator plug smooths out the voltage and provides constant power to the hid conversion kit elimating the flickering lights. These plugs will also provide the correct resistance to fool the vehicles computer into thinking there are good headlight bulbs in use. This will turn off the annoying dash board bulb out indicator light. This product is recommended for newer vehicles with this problem and not required for many vehicles. Don't give up on trying to buy an HID kit. Buy these plugs and have problem free hid installation. If your Vehicle is on this list make sure and add the plugs to your order, if not you will have problems or issues while installing the HID's, no matter what HID kit you purchase on the market! Recommended for many Dodge, Chrysler, BMW, Jeep vehicles. Please note it may not fix your flickering on all vehicle models. Some models simply need additional 50W relay's we sell. 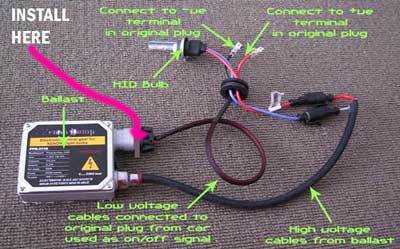 Installing this on any HID kit however can be beneficial in extending life and performance of the kit.